The balloons were tied in wires at 15th Avenue East and East John Street, and as crews cleared the balloons they noticed the equipment had failed. “The balloons may or may not have caused the damage, but we know it triggered something,” Bonaccorso said. Um, sounds like the balloons aren’t off the hook, after all. 2,000 or so customers remained without power as a crew worked to repair damage caused by the Mylar-style balloons around 3 AM. In the last two years, SCE has seen a sharp increase in balloon-related outages, with 689 last year after 583 in 2012. These are the highest numbers since 2007. In addition, there was a 75-percent jump in balloon-caused outages between February (59), when the numbers usually spike, and January (34) last year. The outage does add to our roster of strange and unusual blackout causes on the Hill including this one in 2010 (warning: contains dead crow) and this allegation in 2014 (warning: contains microhousing). Outages around the Hill were first reported just before 2 AM. UPDATE 1:55 PM: Seattle City light is reporting that around 4,000 customers are again without power in the area: “3,985 City Light customers out of power in Capitol Hill, same area as the outage from earlier this morning. Crews en route.” Here’s a map of the outage from the City Light System Status page. Honestly, what would Capitol Hill do without you? Thanks again for the updates and answering all my texts! I am one of the people still w/o power. I am going to bed, but look forward to be woken up soon when everything that was on at 140 am come back on! Correlation does not lead to causation and a ballon does not a cause make without solid evidence. I was with both workers at 3:20am when they were clearing what was later known, but not proved to be a leading cause of the power outage, a knotted ballon mess. When one of the two major news camera persons asserted the balloon senario the workers blurted with mechanical exactness a quick and uncaring, “We don’t know yet”. The camera person shot back a ballon location request and one worker with a joyful annoyance pointed to the ground, “yeah, a piece of it is right there”. Camera got the shot and now capitol hill can sleep sounder than ever as the media pulles a train on truth and justice dragging it down the rails of genocide and lies. Its just another sad day in a culture based on white supremacist imperialist capitalist patriarchy (the living dead). This power outage brings a little light to the hearts that wish this city buried and renewed by the life no one in this city has ever known. Fire to the hearts and minds who fight for all the planets kin. The cause is truly not yet known but when nature shakes their north west shoulder; when you or someone you know gets cancer; you or a close friend is raped or a myriad of infinite ills that plague life in a colonized world, you will not give any f****x about a ballon – you’ll be surviving the apocryphal zombie war. Dude! You need to get some sleep. Where can I get some of whatever you’re on? Voice of Sanity – You said it much more nicely than I was thinking. LOL! Uh, wait a second. A cluster of mylar balloons took down a portion of City Light’s power grid?? OMG. The terrorists have already won! And this is the utility who wants to increase our rates 5% per year for the next six years “just to maintain service.” Think I’ll invest in mylar balloon futures. I wish there was more momentum around burying these power lines similar to what we have downtown. Our region is so beautiful and many otherwise photo-perfect scenes are obscured by ugly (and apparently vulnerable) power lines. Not to mention the the way we have to butcher our trees so that they wrap around the overhead lines. Are you kidding? Do you know how many $$$ Billions would be required for that? Taxes are already bad enough, burying the power lines across the city is not on the list of low hanging fruit. Nope, not kidding. But yes, it’s a dream (hence “wish”). I also dream of mass transit, public space, and education projects. One day we can make these things reality given enough willpower and focus – as evidenced by the other cities who have pulled it off. I’ve lived in a place where all of these lines are buried and it’s a disaster. First of all it takes a LOT of digging to find out what’s wrong. It’s a mess. Downtown works because there is already the underground infrastructure. It would be impossible to build the same kind of infrastructure in the neighborhoods without tearing down buildings and starting over. However, in the future it might be possible to transmit power wirelessly, so there is hope, probably not in our lifetime though. Balloons are a waste of Helium. Helium is an important non-renewable resource. Once it’s gone, it’s gone. Forever. Stope wasting Helium for entertainment. Alpha particles are just ionized helium. You know what makes a lot of alpha particles? Nuclear power plants! So we should build more nuclear power plants. Aaaaannd, power’s out again. Fix ETA 5p. I come across mylar balloons in the deepest wilderness of the Cascades. I never fail to find one or more on off-trail treks. Balloons are pretty for a moment, then they become a nuisance and a wildlife hazard for weeks and months following their release. I’m on the north part of Summit and my power just went off again for about an hour, then just came on again. It’d be super-cool if the City figured out what was going on. I know they work hard and I completely appreciate it, but it’s disconcerting they don’t know why the same area lost power twice in less than 12 hrs. Lost power for the second time as well at the 400 block of Bellevue Ave E. I’m not sure what’s going on with my building- the fire alarm has gone off both times power went out. The power was out for around an hour before it returned a few minutes ago. Even in the windstorm of ’06 I didn’t lose power, but this morning I had nothing, not even home phone service (?). Am not so young, made me realize this is serious, potentially dangerous. Can’t understand why my home phone would be off. Comcast wasn’t accepting any calls AT ALL all day. Is Comcast your phone provider? If so VoIP needs electricity to run the modem and router in order to get your phone service. So, no power, no landline phone. 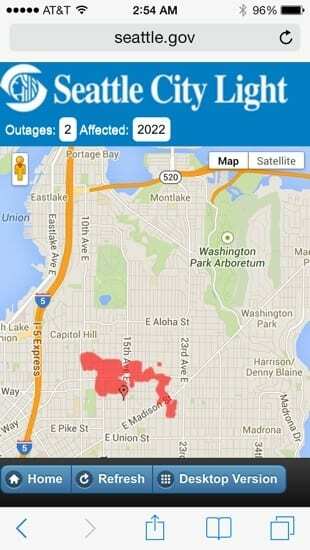 Wow, your snarky commentary really sheds some City Light on this outage. How do you expect to have an exact cause a few hours after a complicated outage happened? The workers on site and the spokesman did what they could to inform you and then to clarify the situation in the light of day.